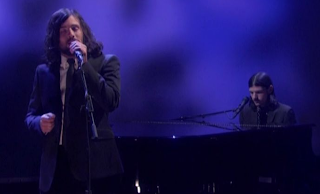 The Avett Brothers appeared on Jimmy Kimmel Live! last night for a very special performance. Backed by the Brooklyn Philharmonic — yes, Jimmy chose the worst weekto be in the Big Apple — the brothers Avett swept through a rousing and yet fitting rendition of “I and Love and You” off the 2009 album of the same name. When they crooned, “Oh Brooklyn, Brooklyn, take me in,” several hundred souls screamed their addresses. Sure, their appearance was to support last month’s The Carpenter, but this was the song everyone needed to hear. Stream below, courtesy of The Audio Perv.